Debunking A Myth: Fidel Castro Was Not Scouted By The New York Yankees The late Cuban dictator didn't try out for the New York team, says Adrian Burgos Jr., University of Illinois history professor. It's fun to contemplate this historical "What if?" but it's pure myth. Cuban revolutionary leader Fidel Castro playing baseball. 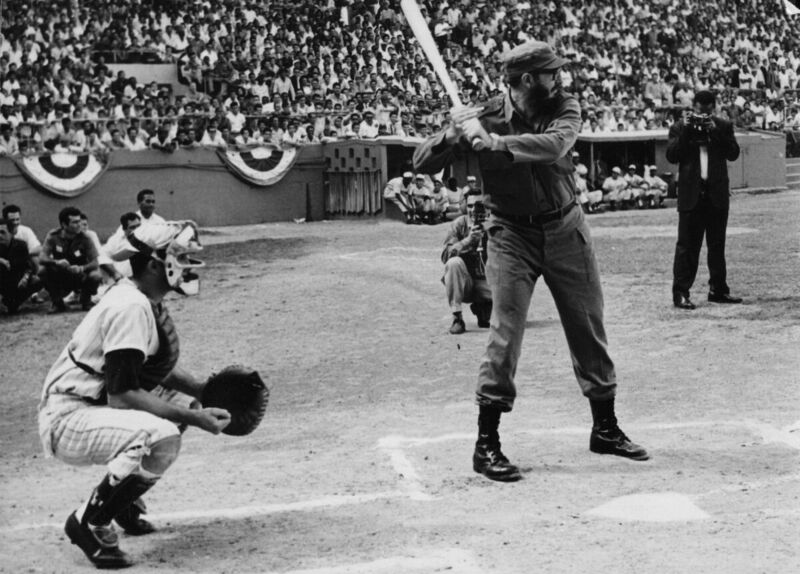 The late Cuban dictator Fidel Castro loved baseball. And you may have heard that he was such a good player that years before the Cuban revolution, he tried out for the New York Yankees in Havana. Or not. This myth has persisted for years, and though it might be fun to contemplate the historical consequences of this "What if?" scenario, Adrian Burgos Jr., University of Illinois history professor and author of Playing America's Game: Baseball, Latinos and the Color Line, says it simply didn't happen. "He didn't try out for the Yankees," Burgos tells NPR's David Greene. It's possible Castro went to an open tryout held by the Washington Senators in Havana, Burgos says, but he was not "at the level of a talented Cuban ballplayer where the scouts went looking for him." The Yankees weren't active in Cuba to scout any talent. They weren't active in Latin America until the 1960s. So it wasn't the Yankees. It was the Washington Senators and the New York Giants, right across the river from the Yankees, that were the most active teams in Cuba. It says a lot about baseball in both Cuba and in the United States. One of the fascinating dimensions of this is that Castro very much loved baseball, he used baseball in a Cuban tradition of politics — that Los Barbudos [the Bearded Ones, Castro's own baseball team made up of revolutionaries] played before exhibition game[s] in Cuba during professional seasons. He wanted to share with the Cuban people that he, too, was a fellow Cuban, he loved baseball. Baseball is such an ingrained part of Cuban identity that he and the other military leaders and even someone like [Cuban revolutionary] Che Guevara had to learn how to play baseball. Fidel Castro enjoyed the myth of him having been a real Major League Baseball prospect and he would not have knocked that down in the least.